As a data-driven initiative, marketing automation is heavily dependent upon the accuracy, completeness and validity of the data that the technology will run on. Inaccurate and out-of-date data, gaps in information and poorly integrated data will all serve to compromise the core objectives of marketing automation, hindering the ability to create relevant, timely and engaging communications, and ultimately undermining efforts to increase loyalty and sales. Worse still, marketing processes driven by bad data can actually damage customer relationships, as demonstrated by numerous studies. Indeed, poor data management is commonplace. In a recent survey by Demand Gen Report, it was revealed that more than 62% of organisations rely on marketing/prospect data that is 20 to 40% incomplete or inaccurate. Additionally, almost 85% of businesses said they are operating CRM and/or sales force automation databases with between 10 to 40% bad records. Far too often, nobody takes responsibility for ensuring that key data is fit for business purpose, adds Turner. Clearly, marketers must play a more active role in data management. So what do they need to do? The Smart Insights Marketing Automation guide explains marketing automation and gives examples of best practices for selecting and implementing marketing automation. 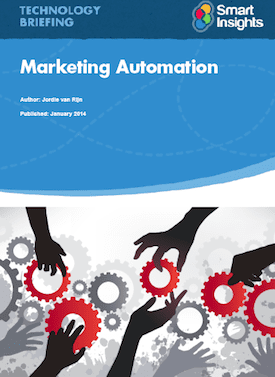 Download our Marketing Automation Best Practice Guide. A marketing automation platform will help users manage their lead process and build better qualified marketing leads, but the reality is that lead quality relies on the quality of your data and the context of your data. And this latter point is a big challenge. 'The information kept in marketing automation tools about a lead – e.g. their name, phone number, email, title, industry and company - are just pieces of the full picture. That information gets you just enough to contact the person for marketing offers. But what if you could add more to that?' asks Wynn White, VP of marketing at Birst. Behavioural data – social and web interactions of the prospect, their likes and dislikes. Historical data - past purchases, support issues and known requests. 360 view of customer – buyer interactions across all your channels – web, store, direct sales, etc. But before attempting database integration to support marketing automation, the marketing organisation must standardise the data from across the organisation. 'In order to create appropriate and timely personalised communications, marketing automation systems need to draw upon customer data and interactions from across multiple communications channels, but it is impossible for any system to derive intelligence from cross-channel data unless each customer’s data in each channel source system can be matched to form a ‘single view’,' says Turner. Turner advises that the marketing organisation therefore work with IT to create a data quality compliance process for source data. This means ensuring that the data entering corporate and marketing systems and processes meets required standards for accuracy, completeness and validity. When it comes to the integration process itself, White recommends that the first step should be to identify all the sources of information that matter. 'Understand where your customers consume most of your information - if your website is your mega phone to the market, then information about click-through paths is critical to your success. Don’t boil the ocean. Pick two to three sources to start. You can always add more,' he explains. and whether the solution has been leveraged in conjunction with a CRM solution are all important factors to bear in mind. 'For a less sophisticated use of a marketing automation solution, the business can simply use the built in filtering capabilities in a data management solution to produce targeted lists that can be imported into the marketing automation solution for email campaigns,' he explains. But the process of data management doesn’t end once integration is complete. Indeed, once you start the process, it never stops. This means ensuring that standards of data entering the marketing systems are maintained, and that there is appropriate controls in place. This is something that Gerry Brown, Senior Digital Marketing Analyst at Ovum, raises concerns about. In light of this, Brown recommends creating a 'power user' in the marketing team to control access to the system to ensure that wrong messages aren’t sent out and data isn’t in need of reconfiguration. Indeed, ongoing effective data management in general is absolutely essential to the success of marketing automation. Rogers further elaborates on the important role that effective data management plays to marketing. 'The ability of marketing automation to successfully perform its key capabilities of identifying and targeting the ‘ideal prospect’ is dependent on the breadth, depth and accuracy of the business information available. Successful deliverability, open rates and click through rates all hinge on the quality of the data that fuels the marketing processes,' he says. 'As well as ensuring the accuracy of data, effective data management can enrich a marketing automation solution with information that helps with targeting and prospecting, and can also be leveraged in the lead scoring/qualification and lead assignment processes. When a lead is submitted via lead form widget, call or chat, the data management solution can identify whether the company is ‘real’, the industry it's in, the size and revenues, number of employees and geographic location. Fortunately, despite poor levels of data management having proliferated in recent times, there are indications that businesses are waking up to its importance. And CMOs in particular are starting to realise their department’s role in data management and quality, according to Turner – which will ultimately provide a considerable boost to their marketing automation efforts. Thanks to Neil Davey for sharing his advice and opinions in this post. Neil is editor of MyCustomer.com, an online community of CRM, customer strategy, marketing and customer service professionals. Creativity and resourcefulness may be the best weapons you can use when it comes to lead generation Lead generation is a crucial marketing activity as it signals the start of what could be a fruitful relationship with future customers. Unfortunately, …..
How to plan, market and execute an event around communication Communication is at the heart of everything we do, enabling us to form relationships, carry out work and achieve our goals. It is also at the heart of successful event ….. The future is now with chatbots, so you need to consider how you can use the technology to improve lead generation In case you haven’t heard, AI’s promise isn’t based on future advances. It’s being used widely now to transform …..